A bold design makes for surprising texture in this Bulova timepiece. 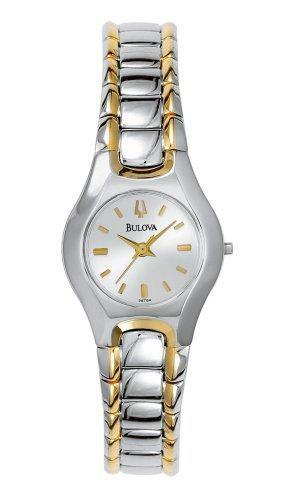 The Bulova Women's Bracelet Watch features a polished brass band with raised, gold-tone edges and a silver-tone center. A brass case houses a silver-tone dial that's framed by a contoured silver-tone brass bezel. A gold-tone Bulova logo at the 12 o'clock position takes its place among the gold-tone stick hour indicators and gold-tone hands. 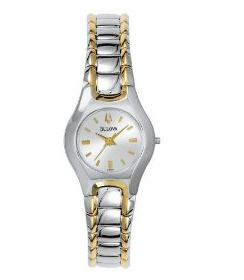 The Bulova Women's Bracelet Watch is water resistant to 99 feet.